Undeniable Benefits of a Stain Free Roof - Pro Wash LLC. A clean, stain free roof can make your home more energy efficient. It is important to have a stain free roof. If you have noticed black streaks, moss or lichen on your roof then your home may not be as energy efficient as it could be. When the bacteria known as Gleocapsa Magma forms dark stains on a roof, the reflective properties of the roofing material are often compromised. This results in unnecessary heat transfer to the attic space above the home. Obviously the black sections of the roof will absorb and transfer more heat than the non-stained sections will, resulting in air conditioning units working harder to cool the interior living space during the summer months. When moss or lichen are present on a roof, they can act as an insulating blanket on the roof and trap heat in the shingles, which could lead to premature shingle failure and increased attic temperatures. Generally, a lighter colored roof will reflect more heat and sunlight than a darker colored roof; however, darker colored roof systems can still benefit from roof cleaning. The following is a short list of some of the benefits of a clean, algae free roof. 1. Prolonged lifespan of virtually any style of roof. 2. Increased energy efficiency by revealing the roofs true color, which is usually lighter in color than the dark stains that overtake them. 3. Mold and mildew control. Mold, mildew and algae will spread to other surfaces rapidly, keeping your roof free of organic growth reduces the chances of it spreading to other areas of your home. 4. Indoor air quality can be greatly improved by cleaning a dirty roof. Mold spores on a roof will transfer into the attic through roof vents, soffit vents or windows. Most people never associate their roof with the quality of the air they breathe inside their home, but it does play a factor. PRO WASH uses and recommends the roof cleaning process outlined in the ARMA (Asphalt Roofing Manufacturers Association) bulletin which sets the standard for the roof cleaning industry across the country. Under no circumstances should “high pressure” be used to clean shingle roofs. 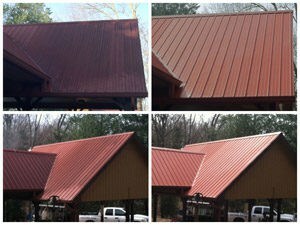 For a free, no obligation estimate on cleaning any roofing material, contact us at 615-999-0104 or visit our website at www.ProWashNashville.com.